Excited and eager tourists, we packed in lots of sightseeing, some fine dining, and Broadway plays into our second day in the city. The next morning we enjoyed a good breakfast in the hotel. From eggs to bagels and lots of yummy items in-between, the Staybridge offered quite a selection. Adding to the ambience of the dining area were the background sounds of Christmas music. Plus, it’s just a little thing, but I was impressed by the bamboo fence outside the huge windows that separated the Staybridge from some apartments. Throughout the room on both mornings that we were there, there was an anticipatory feel of excitement. Everyone was upbeat and looking forward to another day in New York. 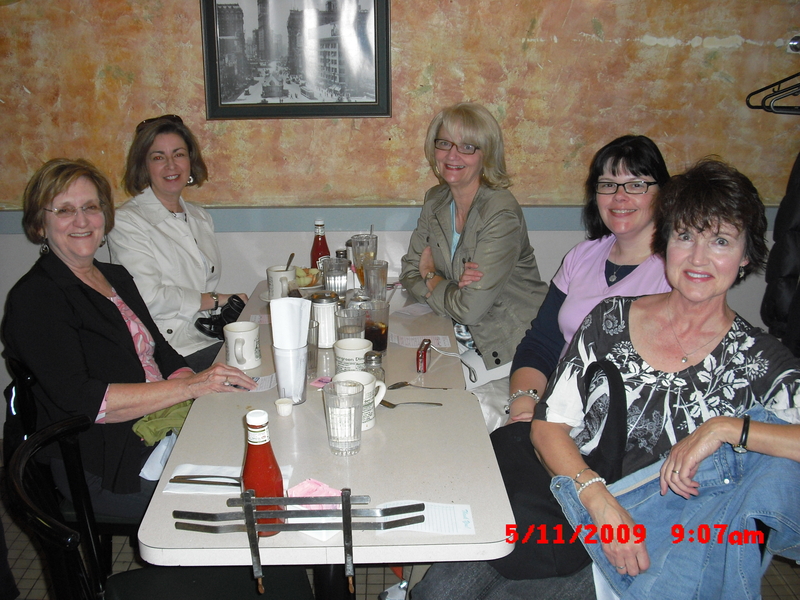 When all six of us had finally gathered, we left the hotel with tour bus tickets in hand. We purchased a two-day tour with tickets to the Empire State Building for $74 each, and we perceived that as “a deal.” I still do. The bus tours are great in that they get you around the city and give you tons of information about the sights and history of New York. Plus, you can get off and jump back on all during the day, so it’s nice to know that if you want to spend a little extra time at the South Street Seaport, then a bus will come by about every 20 minutes. Or say, if your friends want to go to the Tenement Museum and you’re determined to walk the Brooklyn Bridge, there’s no need for concern because a bus will be by shortly. Right, Lisa? 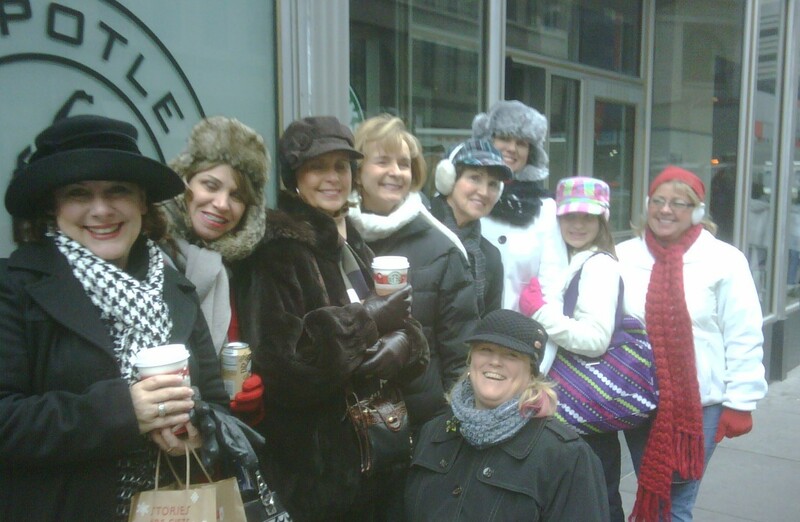 On the way to Empire State Building, we passed a Starbucks, and a couple of the “girls” wanted some hot chocolate. While waiting for them, I spied a friend from Elgin who just happened to be walking by at that moment. How likely is that??? I darted out of the store and ran her down. She and her party united with the six of us in Starbucks for a little conversation, and before parting company, Mary took a picture of the “Southern Girls” outside of Starbucks. Next stop, Empire State Building. Although I’d been there before, it was just as exciting this time as it was before. For anyone who wants to have the total tourist adventure, I highly recommend it. 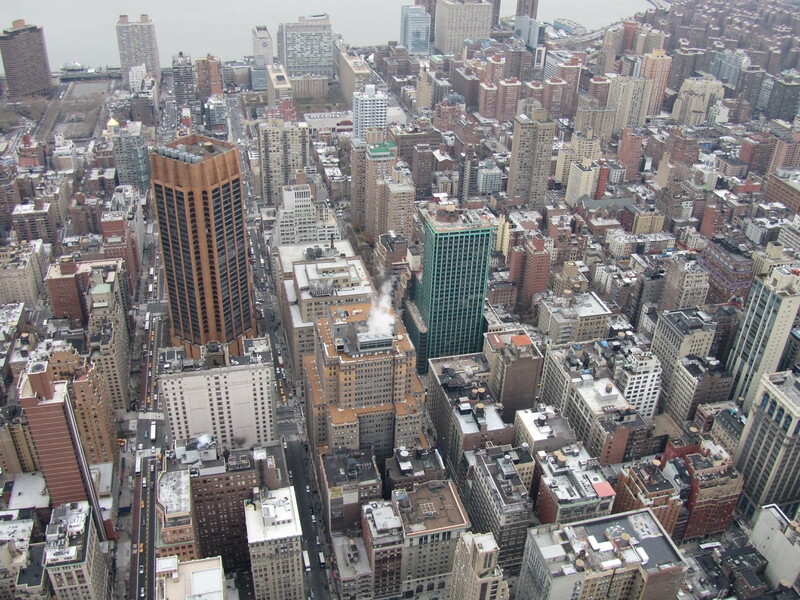 The aerial sights of the city from all angles are awesome. We loved picking out various landmarks such as Bryant Park, the Brooklyn Bridge, and the Flatiron Building. We even spied some ice skaters far in the distance. In addition, the staff there were all helpful. For instance, when we got to the area just before being allowed outside to view the city, I realized that I didn’t have my new Macy’s hat or my gloves. I shared my plight with one of the attendants who called security downstairs to check on my items, and sure enough, the hat and gloves had been put aside for me. After a few calls between security personnel, Jeanita and I were allowed to go back downstairs to retrieve the items and then reclaim our places in line. Leaving midtown, we continued the educational bus tour until we arrived in Chinatown. Hopping off, we were immediately immersed in a different culture. Loved that! We kept on walking until we got to Mulberry Street in Little Italy. Mary remembered a restaurant, Angelo’s, where she had dined before, and we decided to eat there. It was marvelous. White tablecloths, candlelight, Christmas decorations, and Italian music added to the delightful ambience of the restaurant, and the food was delicious too. Dining and conversing with special friends as dusk fell was a treat I’ll always remember. Dinner complete, we headed back to the bus. On the way, we stopped for some souvenirs, mainly scarves and t-shirts. Amazingly, no one in our group wanted purses. Because of our leisurely dinner, souvenir shopping, and bus tour, we made it back to our rooms with barely time enough to change for our evening at the theatre. Two of our group went to see Wicked, and I went with the three others to see A Little Night Music. I can’t speak for the others in my group, but I LOVED it. 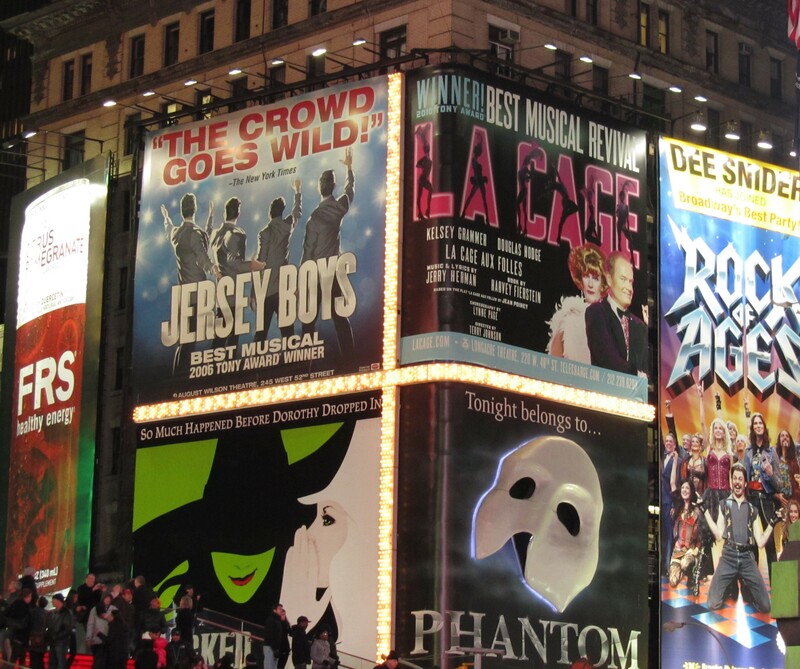 The music, the acting, the plot, and the set were superb, and the theatre itself was beautiful. By the time we left the theatre, we were a bit weary and decided to go back to the hotel rather than dine so late at night, especially since we knew that tomorrow would be busy, busy, busy as we tried to pack as much into our last day as possible. We simply went back to the Staybridge and had some late night conversation before settling down for a long winter’s nap. I hope someone out there (Connie?) is enjoying this travelogue. I’ll finish it tomorrow. My daughter-in-law Kelly is going to New York next weekend, and I’ve been scheming and dreaming of how and when I can go again. Until I have the money and the time, I’m going to do a little walking down Memory Lane. 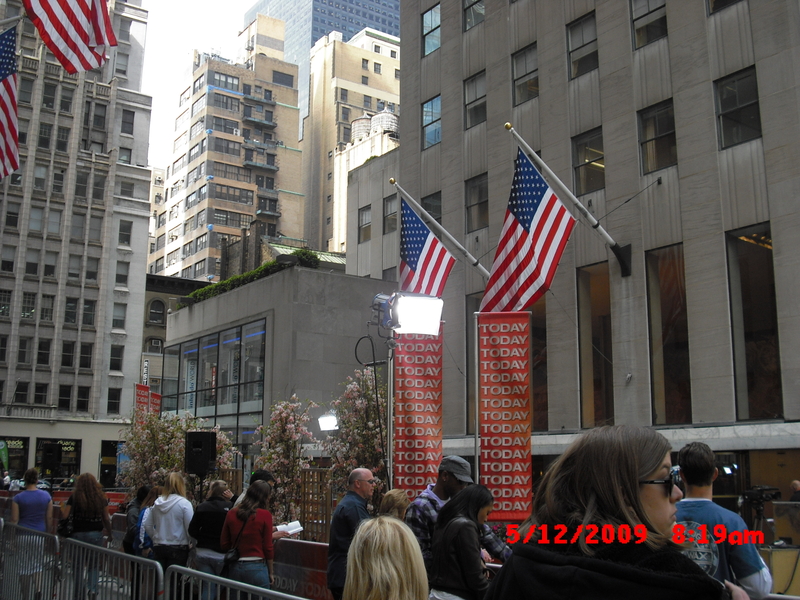 The last time I went to the Big Apple was the first weekend in May. Some work chums and I had been talking about it for a while, and we decided that the weekend of graduation was the best time. Three of the group took Amtrak, and Nancy and I flew out of Charlotte. Our tickets were only $128 round trip, and we had no problems whatsoever. Well, that’s not entirely true because we had a delay of about an hour leaving Charlotte, but that’s a minor thing when you consider the reasonable cost and speedy, comfortable trip. We stayed at Double Tree in Times Square, and one of the many things we liked about our accommodations is that they give fresh chocolate cookies to all of their guests. Yum! Sometimes little things make a big difference. 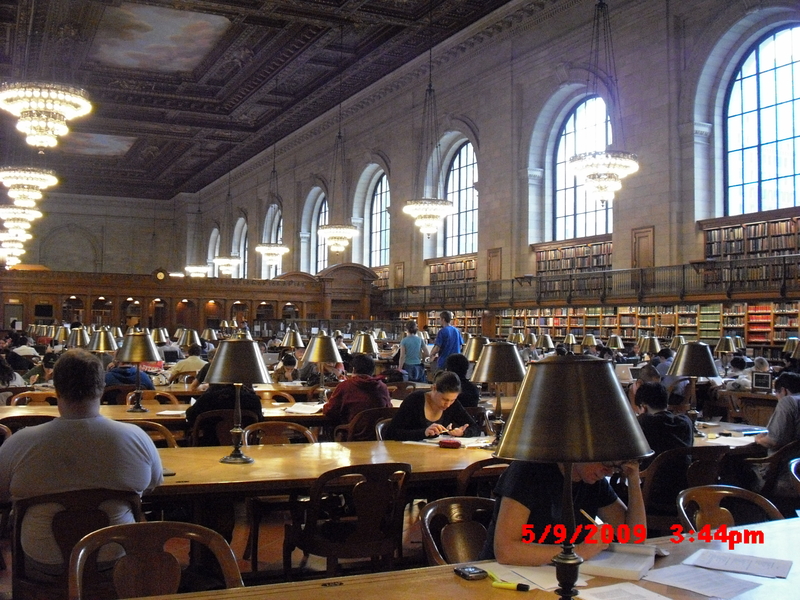 After checking in, we walked to the New York Public Library and were overwhelmed with its awesomeness. Is that a word? The upstairs reading rooms had a hushed, reverent quality about themI loved picking up old tomes and reading bits and pieces of information. 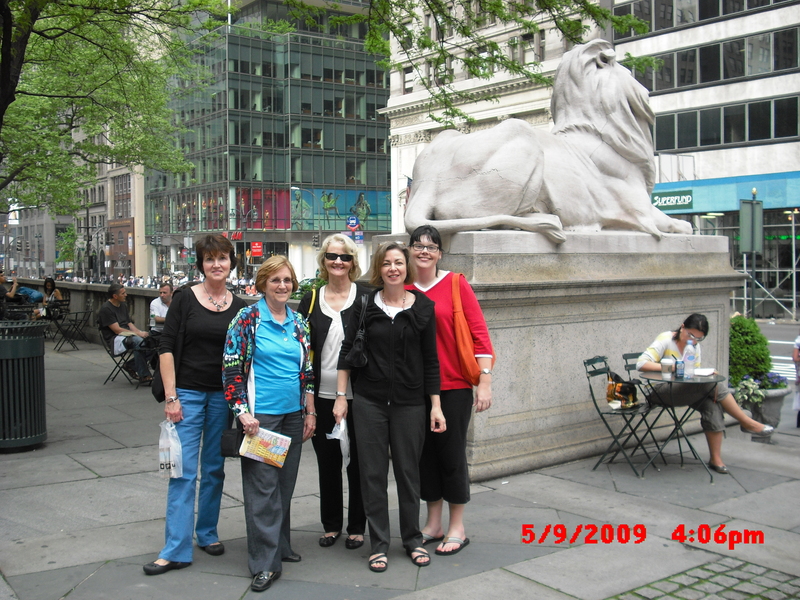 Afterward, Lisa, Linda, and I walked the streets gawking like a trio of exactly what we were, tourists from SC. *The Strand, a bookstore with 18 miles of books. We were agog with the selection of books and atmosphere of the store. *The two-day bus tour that took us on a loop all over Manhattan, complete with knowledgeable tour guides who gave us tons of information about the city’s history and some of its famous residents. *The sights, sounds, smells, and street vendors in Chinatown. We bought neat scarves and purses. *La Mela on Mulberry Street in Little Italy. 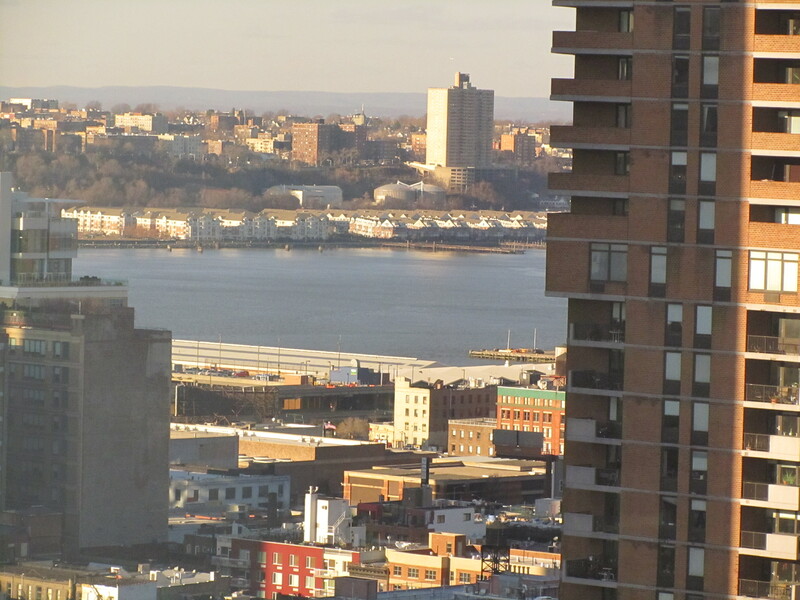 *The South Street Seaport and the mix of people there. 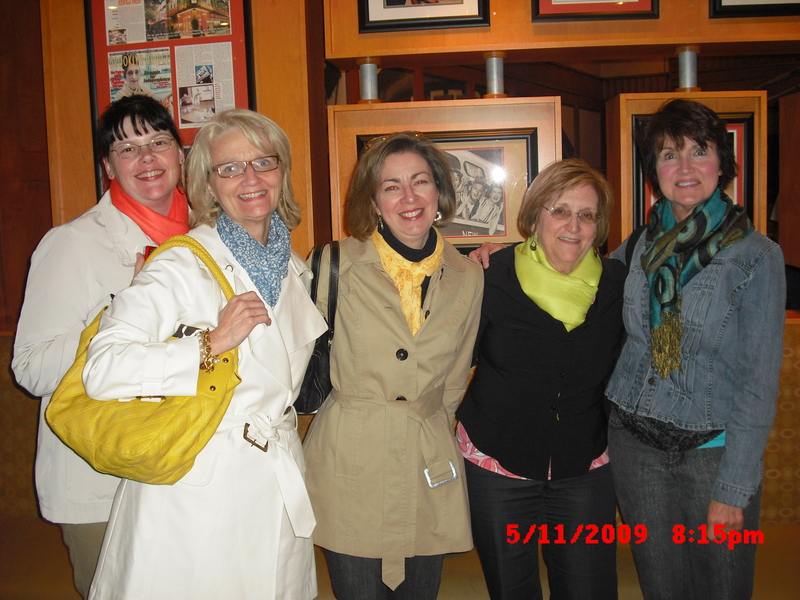 *“Scarf night” at Juniors, a cool restaurant in the theatre district. 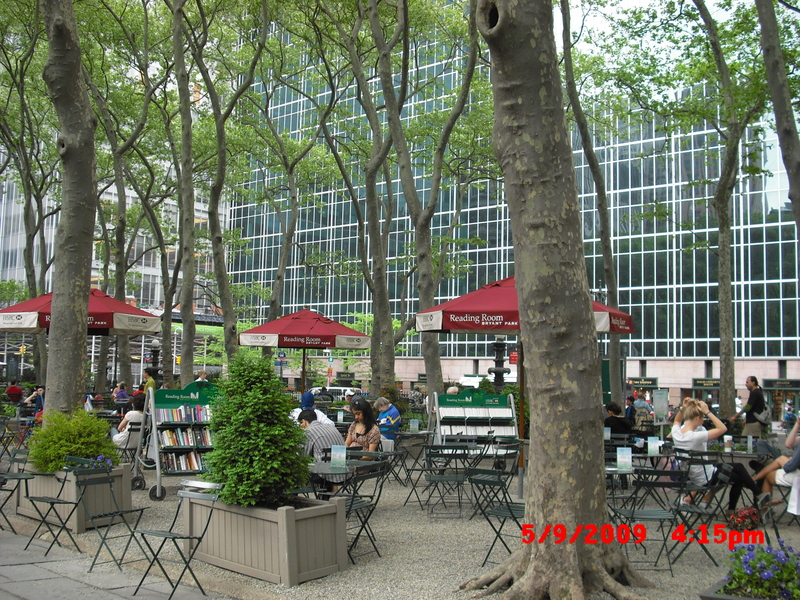 *Bryant Park and its outdoor reading room behind the New York Public Library. 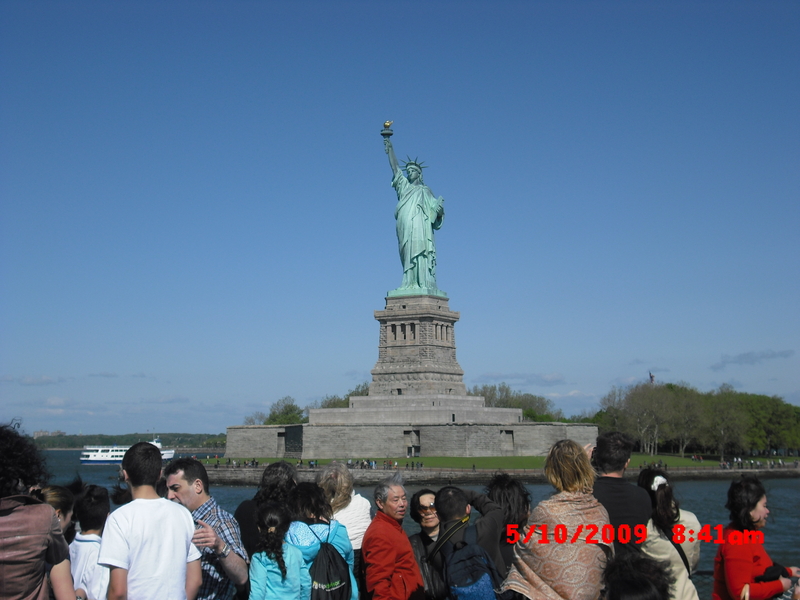 *Liberty Island and the climb to the top of the statue with Lisa and Linda. 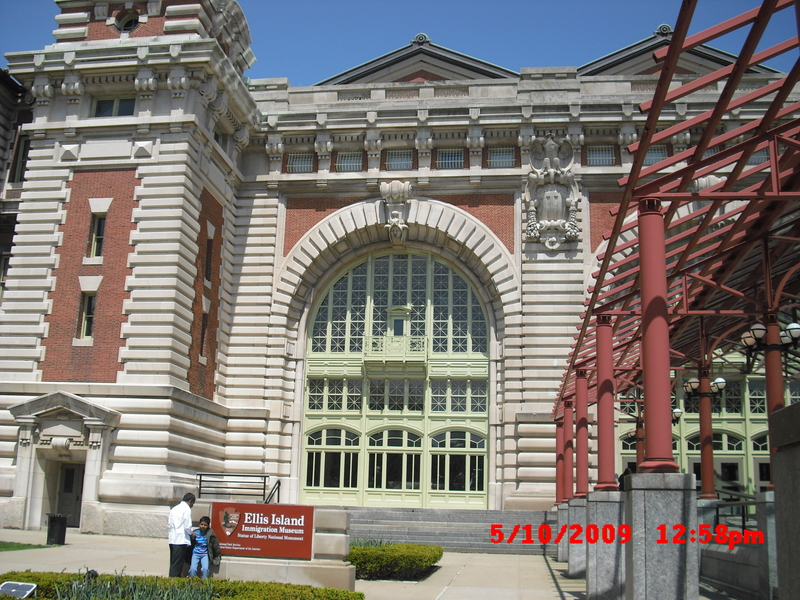 *Ellis Island and the ambience in the great hall. I enjoyed this stop so much that I’ll probably write more about it later. *The variety of people on the ferry to Liberty and Ellis Islands. 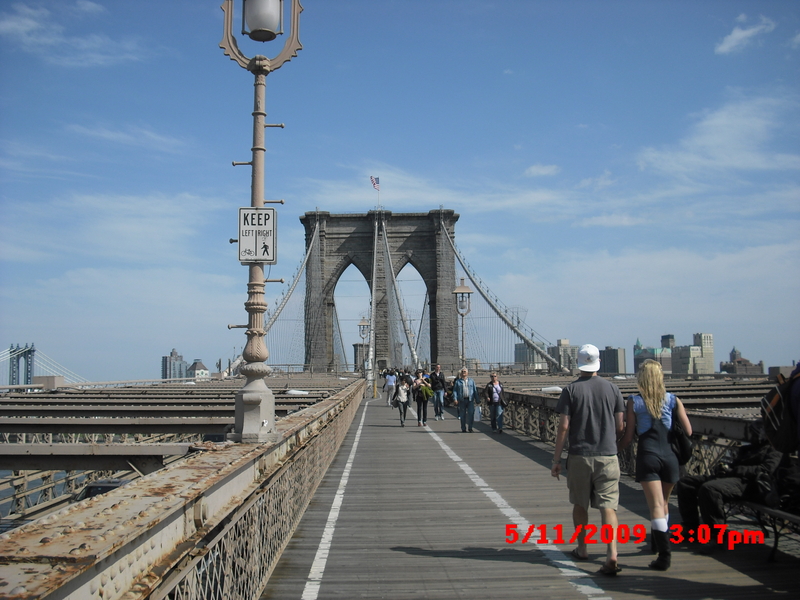 *Walking across the Brooklyn Bridge to Brooklyn and back to the southern tip of Manhattan. *Seeing West Side Story with Nancy and Martha (loved the scene at the gym when Tony and Maria first see each other). Lisa and Linda were equally impressed with Wicked. 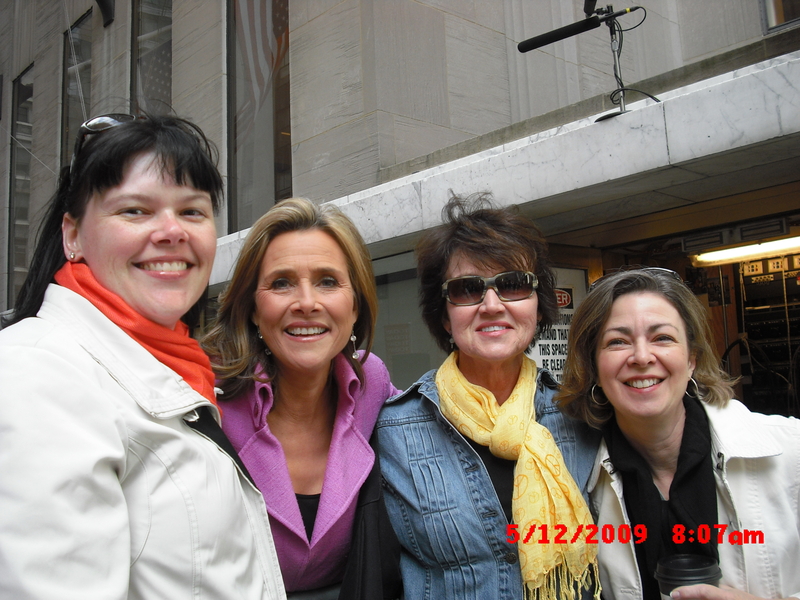 *Being at the set of Today and having our picture made with Meredith….also with Lenny, a regular on the show. What made the trip especially nice was traveling with such compatible, pleasant people. This is an extremely important element to consider if you’re considering a group trip. Not a harsh word was spoken, and all three nights I fell asleep hearing laughter and happy conversation. We didn’t do everything together, and we were fine with that. 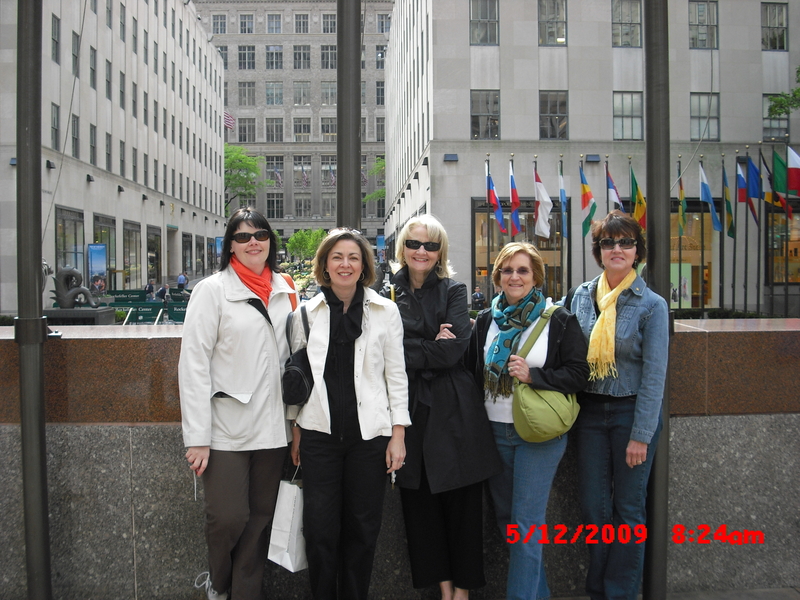 Lisa, Linda, and I played the tourist role to the max while Nancy and Martha visited museums. 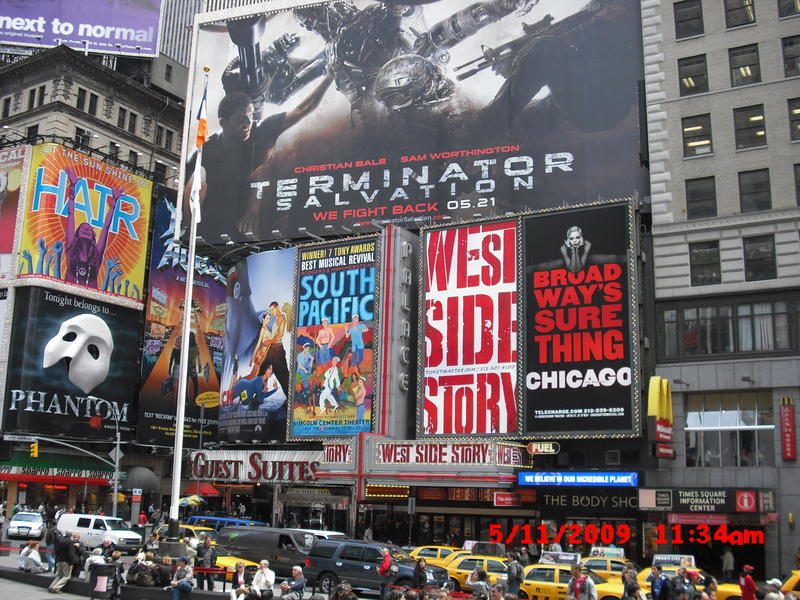 Anyone out there up for a trip to the Big Apple? I want to see The Lion King and need some pleasant, compatible travel buddies. Just say when. My mother said that once on our way home from Charleston when I was about 3, I wanted to take the Cooper River Bridge home with me. Hmmm. I think that was just the beginning of a lifelong affinity for bridges. There’s just something about them that captivates me. Maybe it’s because they symbolize movement from one place to another or a change from one part of your life to another, a transition of sorts. You can’t very well reach the other shore if you stand shivering and afraid on the homeland (so to speak). When Connie and I dined on Mexican food earlier this evening, we began talking about our New York trips and the fun and memorable experiences we had. Although we went at different times and with other people, we still enjoyed reminiscing about the high and low points of our visits. As we chatted, I realized that I hadn’t written anything about my most recent visit to the Big Apple at the first of May. The hour is late, and my brain is a bit muddled, so I’m not going to go into a detailed description of everything we did. Nope. I’m just going to mention THE BRIDGE. For weeks before we left, Lisa and I talked about how she’d walk across the Brooklyn Bridge with me if I’d sit in Central Park with her and sip a latte or some other tasty beverage. “It’s a deal,” I promised. After reading A Tree Grows in Brooklyn as a book club selection last year, I was determined to at least “set foot” in young Francie’s city. Yet when the time came, our schedules got a little too crammed, and I soon realized that if I was going to cross the bridge over to Brooklyn, then I was going to do it alone. Leaving Lisa and Linda on the tour bus, I bravely (my perception) walked the two blocks to the start of the bridge ALONE. Well, sort of alone. I was surrounded by throngs of humanity, all strangers. Approaching the bridge, I was awed by its beauty and structure. I was also surprisingly pleased at its human traffic since hundreds of people were traversing the mile long bridge between lower Manhattan and Brooklyn. While many were tourists with cameras like yours truly, many were not. The latter were dressed in suits, scrubs, uniforms, and other types of clothing that indicated that they were either coming or going to work. One of the neatest things I saw was a young Japanese couple having wedding pictures taken. I took several pictures on the way over, and some of them are in this blog. The South Street Seaport shops where we had browsed the day before is the first one…after the shot of me waving good-bye to Lisa and Linda. The others are simply bridge shots. I loved the experience. It was awesome, and I plan to do it every time I visit the city in the future. I think, however, that it’d be more memorable and enjoyable if I had a walking buddy next time. Do I have any volunteers?